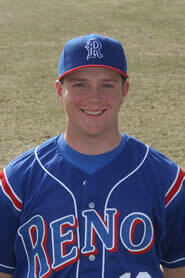 The honors continue to roll in on the high school baseball career of Reno High pitcher, Garrett Luippold. He was recently honored by Rawlings and the American Baseball Coaches Association as a pitcher on the All-Region Baseball Team. The ABCA is a national coaches association made up of collegiate and high school coaches around the country. Garrett was honored for his tremendous senior season for the Huskies as he compiled a 7-0 win loss record in 49.1 innings pitched. He had 74 strikeouts while only walking 24 batters. Opponents hit only .172 against him. Luippold earned an outstanding scholarship to play baseball at the University of San Francisco. He had a 24-1 lifetime record for the Huskies and a 23-5 record for the Reno Knights. He is one of the greatest pitchers in the history of Reno High Baseball.